The Sekforde Arms was a Young's pub in Clerkenwell. 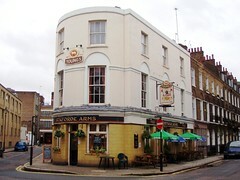 Young's relinquished the lease around the start of 2014, and although the pub remained open for some time afterwards, it finally closed for good on 31 July 2015. According to the Feb/Mar 2018 London Drinker, the premises have now reopened as The Sekforde, a combination pub and restaurant. According to the Feb/Mar 2014 issue of London Drinker magazine, Young's have relinquished the lease of the Sekforde Arms, and although it remains open under temporary management, it's likely to close and be converted to a restaurant. On Kat's visit in August 2014 it was still open and pretty much unchanged from the description below. This old corner pub is pleasingly untouched by Young's trend for refurbishing, aside from having bare wood floors. It's a small corner site, with some tables opposite the bar and larger ones hidden by some pillars towards the back. There are tables outside on the street, and there's an upstairs room as well. On our Friday visit in August 2012 it was busy without being overcrowded. There are four handpulls at the bar, with Young's Bitter and Special and Caledonian Deuchars IPA in August 2012. Ewan felt the Young's was well-kept, and good value for the area. A pint of Young's Bitter was £3.50 in August 2014. According to Young's website as of September 2012, food is served noon-2:30pm and 6-9pm Monday to Friday, with toasted sandwiches available at all other times (around £3 as of August 2012). The food is standard pub grub. In March 2007, bob's steak and mushroom pie (£5.50) was satisfactory, while Dean's cod looked a little disappointing, though he was happy enough. On Ewan's August 2012 visit, prices weren't much higher and the menu was still pleasingly unfancy, with a £5 fish and chips special listed on a chalk board. Ewan's half grilled chicken (£8) was well-cooked and tasty, while Kerry's cheeseburger got a thumbs-up. Ewan's verdict: This is a good, unpretentious local pub serving well-kept ale and decent food. Service is friendly and attentive, and I'd happily return if in the area. Last visited by Kat and others, August 2014. Last edited 2018-03-03 17:38:09 (version 26; diff). List all versions. Page last edited 2018-03-03 17:38:09 (version 26).